Columbia Heights Sheep Gone Wild! Don't be fooled by the cuteness. This creature could be planning to run you down at any moment. Columbia Heights Day was Saturday, and if you missed it, you missed out! Not only were there musical and dance performances, a dog show, exhibits and games ... there was a Sheepy McSheeperson ON THE LOOSE! First, the sheep ran amuck, practically charging down a pink-swathed toddler as it wantonly frolicked. This is NOT ACCEPTABLE, people! And the aftermath of what was surely an epic capture proved awkwardly fitting. This is surely not something that's been spotted around Columbia Heights before, at least in the last century or so. 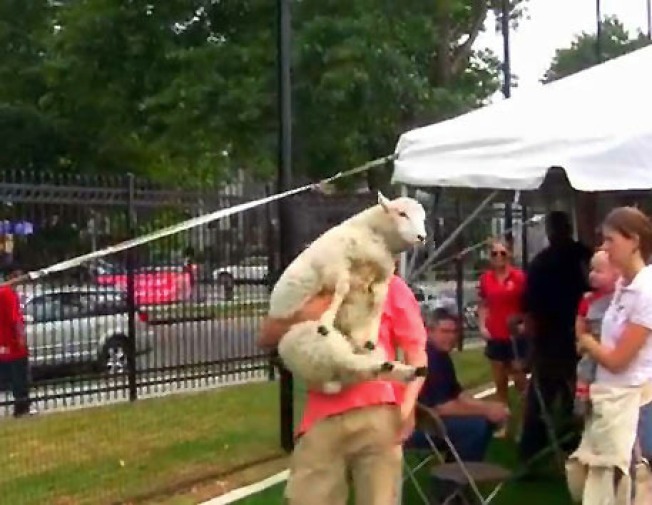 A poor petting-zoo staffer had to heft the sheep across the field and back to the pen. We've never thought what carrying a sheep might entail, but that barnyard creature looks awfully bulky! Getting our luggage through the Metro turnstile at National Airport is one thing, but we have desk jobs. There are no sheep-carrying muscles in our atrophied bodies.